Severin is a passionate meditator, astrologer and practitioner of Advaita Vedanta, and continues to study these subjects from his home in Guatemala. 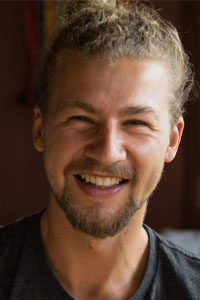 In 2013 he completed the Hridaya teachers training and in 2014 he built a beautiful retreat center, The Hermitage Retreat Center, on Lake Atitlan, which offers individual retreats, dark retreats, and long group mediation retreats. He has a baby boy named Benzra who he loves to spend early mornings with watching the sun rise over the lake.